To the left is a photo of the original parish building of the Methodist Episcopal Church where Reverend J. J. Steadman once served as minister. In 1831 John J. Steadman was appointed third preacher of the Euclid and Cleveland Circuit. He was a native of Cattaraugus County, NY; his parents died when he was quite young, and the bereaved family moved to Charlestown, Portage County, Ohio, where young Steadman was converted under the labors of B.O. Plimpton in 1824-25. He immediately gave himself wholly to the Lord and zealously engaged in this service. He thirsted for knowledge and found time to study at the home of A.C. Gardner, Esq. of Parkman, Ohio. How is John Judson Steadman important to the Hall family history? 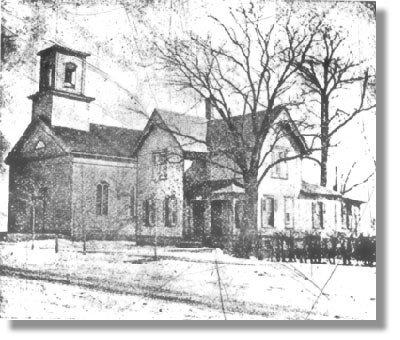 It is because Luke Hall, married to Mercy Steadman, lived in Charlestown, Portage County, Ohio at this time, and Luke and Mercy were very active in founding and establishing this very church. Also part of this church were Dennis Steadman, and his wife, Matilda Worden Steadman, a Worden from South Kingston, Washington, Rhode Island. Much more will be written of them in following posts. Meanwhile, please see previous post on the History of Erie Conference, and this family as it is involved with Reverend John J. Steadman’s church.